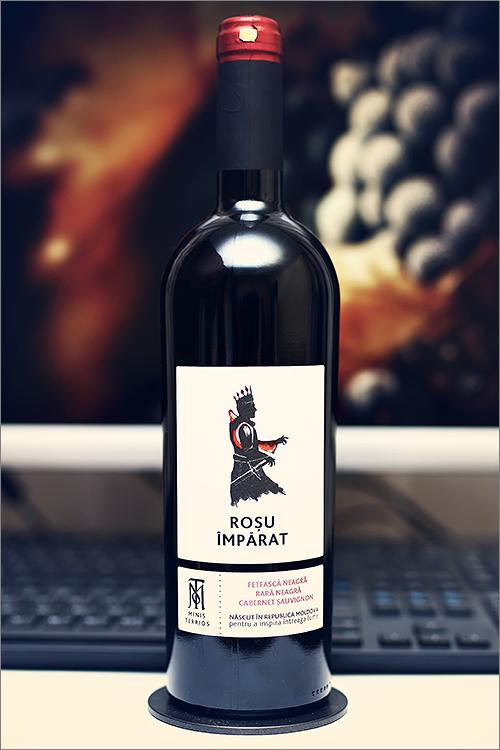 The wine we are going to review tonight is a bit special – Rosu Imparat 2015 by Minis Terrios. This is the winemaker’s first wine blend, made of two indigenous grape varieties – feteasca neagra and rara neagra, enchanted with a bit of cabernet sauvignon in order to get more structure and complexity. All three varieties were vinified and aged in oak barrels individually, with different ageing times: cabernet sauvignon was aged for 20 months, part of the feteasca neagra (50%) – for 12 months, while rara neagra – for 8 months. But enough theory, without further ado, let’s get straight to the tasting! Deep garnet color, not too opaque, with indigo shades towards the rim of the glass. The nose is strong, filled mostly with red fruits and savory flavours: overripe strawberry, ripe sour cherry, ripe red apple, blackcurrant, red plum, ripe rose hips, black cherry, sweet cherry, ripe cranberry, leather, raw veal meat, forest floor and some insistent notes of horse saddle. An instant later the nose is filled with nunced notes of red pepper, paprika, nutmeg, rooibos tea, sundried oakwood and some subtle hints of beetroot. The wine is dry, with moderate alcohol level, high acidity and fine tannin. It tastes lean, supple and opulent, with a nuanced leathery-tart accent. This is a plump, fruity yet savory and meaty wine blend, as it feels a bit seedy, bitter and quite off its balance – not ripe enough, with a very nice tannic grip on the mouthfeel. The wine has a fair overall balance between all those fruity and savory notes, which makes it a quite velvety blend. It has a medium-plus finish and a balanced, lean and supple aftertaste. Conclusion: this is a fine wine blend that is still on the rise, one that has yet to reach its prime form, as it requires a couple more years of bottle ageing to round up. It feels a bit off its balance at the moment, as it tastes a bit bitter and a bit too tart, yet, despite its youthfulness, this is one of the blueprints wine blends of indigenous grape varieties. In order to counter-balance all that acidity and bitterness in the wine, we would suggest to pair it with meaty dishes with smooth and creamy textures, like for example a beef fillet mignon with foie gras and madeira sauce or a ribeye steaks with red wine sauce. Cheers!